Built-in Test (BIT) 簡單來說就是把 object 內( 在 OO 中來說 )加上 self-testing 的部分, 因而此 object 就會有兩種 modes, 一種是正常的 functional mode, 另一種是 testing mode. 藉由執行 testing mode, 可以確認 object 的運作是否正常, 因而達成 testing 的部分目的. 因為此 tests 是建立在 object 內, 因此叫做 Built-in Test. 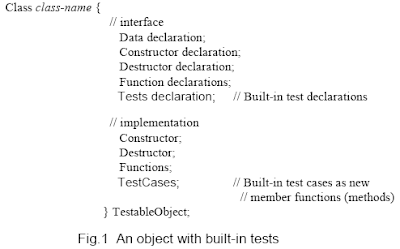 這些 built-in tests 可能會以 testcases 的方式呈現, 但是基本上跟 JUnit 之類的 testcase 還是有所不同. 例如 BIT 可以測試的對象以及能保證的事情, 跟一般在 object 外部的 testcase 就不完全相同, 同時兩者所持的觀點也不相同. 當然我們也可能把一般的 testcase 整合進 object 內作成 BIT 的樣子, 但是這樣一來就失去了不少 flexibility, 同時也造成 maintainability 的問題. 另外一個問題是, BIT 幾乎只有對原始程式碼了解的人, 可能只有原本的 developers, 可以產生, component consumers 要加入 BIT 有許多困難存在. This entry was posted on 下午9:43 and is filed under Noun Explanation , software testing . You can follow any responses to this entry through the RSS 2.0 feed. You can leave a response, or trackback from your own site.